Perched on a mountain top Ronda has been home to the Romans and the Moors who have left their mark and has many fascinating sights to enjoy. Ronda in Andalucia, Spain is a hilltop city split in the middle by the El Tajo canyon. The city was home to the Romans and the Moors and many fascinating ruins and sites have been left behind. Ronda has winding and narrow streets, with more attractions around every corner, including bridges, viewpoints, gardens and museums. To give you an idea of how fascinating this relatively small hilltop city is, I first spent a three-day weekend here, constantly on the go, and only managed to see a fraction of the attractions. I recommend you wear comfortable walking shoes and always carry a bottle of water, especially in the summer months. Explore some of the major attractions of Ronda below. Keep watching this space for more details of sights to see in Ronda, Andalucia, Spain. Ronda has three bridges in total, the Roman Bridge (or old bridge), the Arab Bridge and the New Bridge pictured here. The word “new” doesn’t really apply as it was completed in 1793 by Spanish inhabitants of the town. 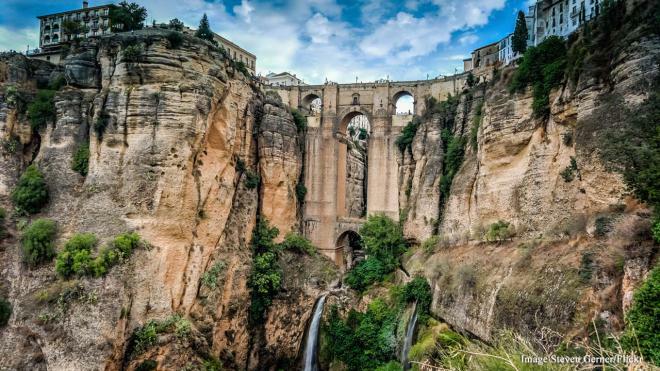 This is quite an impressive feat of engineering and stonework, as the bridge extends down into El Tajo – the gorge – and also sports ornate roofs. The New Bridge connects the two halves of Ronda and of interest to note, the Parador de Ronda is perched on one side. 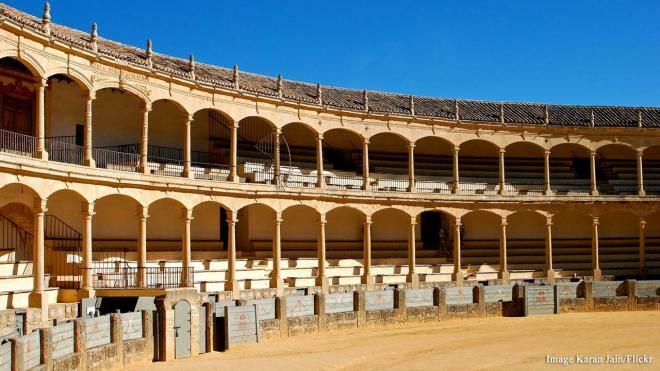 While bullfighting is a frowned-upon sport with many people these days, Ronda does boast the oldest bullfighting ring in Spain. Two iconic writers, Orson Welles and Ernest Hemingway, have lived in the city and left their mark, with roads named after them. Both writers enjoyed the brutal sport.